This adds https://github.com/mysticatea/abort-controller to polyfill [AbortController](https://developer.mozilla.org/en-US/docs/Web/API/AbortController). This is used to cancel requests when using `fetch`. This also updates `event-target-shim` to 5.0 to make sure we only have one version of this dependency. This updates required adding a polyfill for `console.assert` which is used by the new version. I made one based on https://github.com/gskinner/console-polyfill/blob/master/console.js#L74. The polyfill is very small, especially since we already use `event-target-shim` so I think it makes sense to include in core. Depends on #24418 so that the fetch polyfill supports the `signal` parameter. This makes the RCTEvent protocol more generic to make it easier to use the event coalescing feature for type of events other than components. This does a few other improvements that will be useful in follow up PRs. - Add `RCTComponentEvent` which is used instead of deprecated `[sendInputEventWithName:body:]` and remove that method completely (was only used at 2 places). - Make `coalescingKey` optional for events that return NO from `canCoalesce`. - Make `viewTag` optional for events that are not related to views. - Fast path for events that return NO from `canCoalesce`. - Add a missing test for event coalescing with different view tags. Ended up making only one PR for all this since the changes are related and hard to separate. Use a custom RCTEvent subclass with `[sendEvent:]` (preferred way to allow type safe events) or `RCTComponentEvent`. When using react-native inside a monorepo with yarn workspaces the react-native installation can get hoisted and the assumption that the project is located in the folder where node_modules is is no longer true. To handle this case I added an option to pass the path of the project root. It could be possible to change the default to `$PWD/..` since pwd is where the xcode project is located but then it would break if the native project structure is not the one we assume. To avoid the breaking change I decided to just keep the existing behaviour and allow changing the path with `PROJECT_ROOT`. We have a million of inline styles in RNTester which causes a lot of noise with the lint bot in PRs. The rule makes sense for the main libraries but for RNTester it usually makes examples easier to read to just use inline styles. Also reduces lint warnings from 357 to 77. On Android `textTransform` breaks other styles applied to the text. It seems related to the usage of `ReplacementSpan` which allows drawing the text manually but seems to throw away some changes made by other span applied to the text. To fix it I removed the usage of `ReplacementSpan` and simply transform the text before appending it to the `Spannable` string. To make sure textTransform is inherited correctly I added it to TextAttributes which handles this. The main goal of this change is to fix an issue that happens on iOS when the native app starts before the packager server is available which causes app reloads to fail continually until the app is restarted. What happens is that with the current setup we call `RCTBundleURLProvider#jsBundleURLForBundleRoot` once in `AppDelegate#didFinishLaunchingWithOptions`. If at that point the packager server is not running yet it will return nil (expected behaviour) and that will be passed to the bridge constructor. Subsequent reloads will keep trying to load this nil bundle url since it has no way to ask `RCTBundleURLProvider` for a new url now that the packager is actually running. We can fix this by using `RCTBridgeDelegate` instead which is a lot more flexible. Instead of passing the bundle url at construction time it will call the `sourceURLForBridge` method each time the bridge is reloaded. This means that even if the packager is not running yet and that `RCTBundleURLProvider` returns nil for the first invocation, subsequent reloads will call `RCTBundleURLProvider` again for a new value. This allows using things like async functions with text input event props. I think a common pattern is to use async functions with the onRefresh prop to reload data. I made the type `mixed` since we don't care about what the function returns. Could also be `void | Promise<void>` I haven't really seen a pattern for those in the codebase. Babel helpers and regenerator runtime will be imported automatically from `babel/runtime`. We still need to add the global regeneratorRuntime for jest tests since we disable babel-runtime currently. This flow type is wrong, probably just a copy paste mistake. The RN transformer currently relies on the enviroment providing babelHelpers and regeneratorRuntime as globals by using 'babel-external-helpers'. This wasn't really a problem before since helpers were stable and we could maintain our copy easily but it seems like there are more now with babel 7 and it makes sense to include only those used by the app. This is exactly what babel/transform-runtime does. It will alias all helpers and calls to regeneratorRuntime to files in the babel/runtime package. This will solve issues like this #20150 caused by missing babelHelpers. This solution also avoids bloating babelHelpers to fix OSS issues like the one linked before. - Updated tests so they all pass. - Tested that it actually works by applying the changes locally in an RN app. - Added a test for async functions, to make sure regenerator is aliased properly and doesn't depend on the global. - Made sure require-test.js still fails if the require implementation contains babel helpers (by adding an empty class in the file). I've seen quite a few PRs try to change sync'ed files so let's add this warning and hope people read it. Not sure if it's better / possible to put it in the oss folder instead. RN animations currently ignore the `Slow Animations` option on the iOS simulator because we don't use UIKit animations directly. This uses a private api to get the slow coefficient and use it in the native animated driver. We only compile the private api code on simulator so this won't cause issues for app store approval. One possible issue is that the api changes in new iOS versions but I think it's reasonable to do this. Note that this won't work with JS driven animations, we could expose the slow coefficient as a constant and use that in JS but I decided not to implement it. When looking at enabling gzip content encoding on Android I stumbled on this old issue where the body content is not decoded. It happens because okhttp only handles gzip decoding if the user does NOT provide an accept-encoding header. This is pretty confusing because on iOS we need to pass the header manually if we want to receive a gzipped response. I think it makes sense to handle the decoding no matter what. See the comment in code for more details. When using an InputAccessoryView attached to a TextInput the safe area insets are not applied properly. This uses different autolayout constraints that works in all cases I tested, roughly based on the technique used here https://github.com/stockx/SafeAreaInputAccessoryViewWrapperView/blob/master/SafeAreaInputAccessoryViewWrapperView/Classes/SafeAreaInputAccessoryViewWrapperView.swift#L38. Currently the warning is always triggered, even on iOS. This simply adds a platform check and tweak the message. Elevation should be supported by the native driver as it's a non-layout prop. The `hmrEnabled` flag was not passed to the metro runServer config which caused HMR to be broken. In #18936 we decided to deprecate `focusTextInput` and `blurTextInput` but since then I found a valid use case for it that is pretty much impossible to implement otherwise. I think it is best to just bring back this api. Follow up to a9792ac. I assume it's enabled for fb flow config so we can avoid future breakages if someone decide to use this syntax. This makes sure new projects typecheck properly since RN can use this syntax. I broke `currentlyFocusedField` when adding it back in ce3b7b8 because `this` no longer refers to the proper object because it is assigned here ce3b7b8#diff-b48972356bc8dca4a00747d002fc3dd5R330. This code was pretty prone to breaking so I simply removed the `this` usage and rely on a top level variable instead. Also moved everything to named functions. This fixes some regressions with local-cli introduced in c4a66a8. - The middlewares were not added to the metro server. This causes some packager server features to fail. The one I noticed is that the /status endpoint didn't exist anymore which causes CI to fail and also Android to not load the bundle from the packager initially. The remote debugging feature was also broken. Cleanup the `isIPhoneX_deprecated` constant which was said to be removed by June 1st 2018. While investigating an issue about blobs (#18223), I noticed that the fetch polyfill (https://github.com/github/fetch) uses blobs as the response type by default if the module is available (https://github.com/github/fetch/blob/master/fetch.js#L454). This surfaced some issue with the blob implementation on iOS that has since been fixed. However after further review of the fetch polyfill and the way Blobs work in RN, I noticed a major issue that causes blobs created by fetch to leak memory. This is because RN blobs are not deallocated automatically like in the browser (see comment https://github.com/facebook/react-native/blob/master/Libraries/Blob/Blob.js#L108) and the fetch polyfill does not deallocate them explicitly using the close method. Ideally we should implement automatic blob cleanup when the instance is garbage collected but implementing that is probably somewhat complex as it requires integrating with JSC. For now I suggest disabling the default handling of requests as blobs in the fetch polyfill. This will mitigate the issue for people not using Blobs directly. I'm not sure how well documented the Blob module is but we should make it clear that they currently require explicit deallocation with the close method for people using them directly. Run a simple http request using fetch and make sure it does not use the Blob module anymore. [GENERAL] [BUGFIX] [fetch] - Do not use blobs to handle responses in the fetch polyfill, fixes potential memory leak. a275eac removed TextInput.State but we should keep it as it was a public-ish API and we don't have any migration plan off it. Also bring back `focusTextInput` and `blurTextInput` with a deprecation warning. What seems to happen is that RN `currentlyFocusedTextInput` goes out of sync with the focused text input and is null even if there is still a text input focused. I haven't had time to investigate the cause of that (probably some race condition because of trying to focus and blur at the same time) but we should not try to dismiss the keyboard when tapping another TextInput in the first place. I reproduced the bug mentioned by setting `keyboardShouldPersistTaps` to `"never"` in RNTesterPage.js and then using the steps described above. I made sure that the bug did not happen after this change. Border radius already works properly with native animated but was not in the whitelisted props. Tested in an app that animating border radius with native animated actually works. 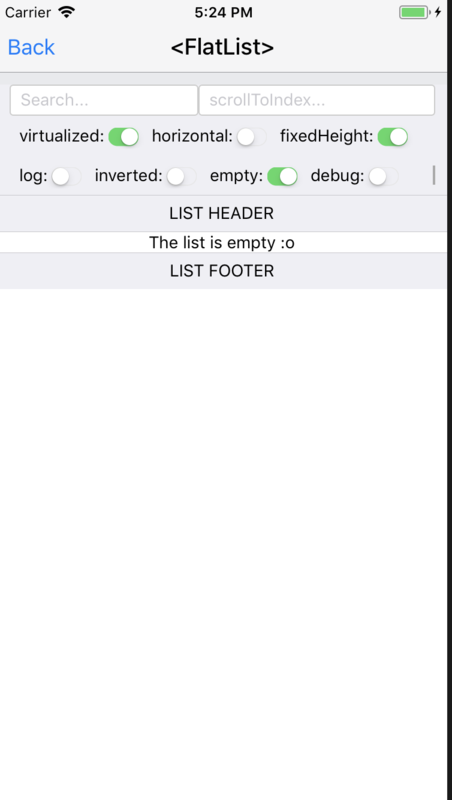 We currently handle empty body poorly in the iOS blob implementation, this happens because of an early return that cause the blob response to not be processed by the blob module, resulting in an empty string as the body instead of a blob object. We also need to make sure to create an empty blob object when data is nil (empty body) as per the XMLHttpRequest spec. The Android implementation was already handling this properly. The js bundle task does not run when `org.gradle.configureondemand` is set to true. This uses `afterEvaluate` instead of `gradle.projectsEvaluated` which is executed properly. Add `org.gradle.configureondemand=true`, run RNTester in release mode and make sure the bundle task is run. 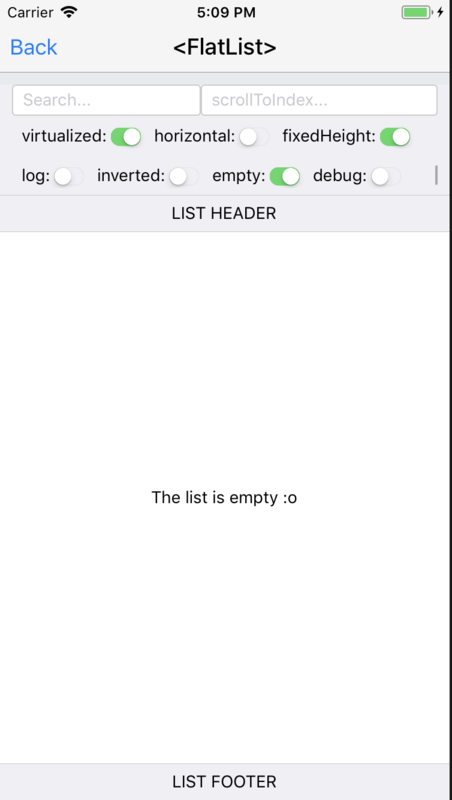 A common UI pattern for list empty states is some text/images centered inside the visible part of the list. This is pretty hard to do currently because we wrap ListEmptyComponent with an extra view with no way to style it so we cannot just use `flex: 1` to make it fill the available space. RNTester used a copy of the main react.gradle file instead of the real one. Recent changes to the real file caused builds to fail with older gradle versions but was not caught by CI because it wasn't using that file for RNTester. That copy of react.gradle is just a leftover from when projects included a copy instead of importing the one in RN directly. Note: CI WILL fail with this PR, if we have trouble landing this I can add the revert in this commit too but wanted to keep it as 2 separate commits. Tested that building RNTester actually fails now that it uses react.gradle with recent changes, then tested that is builds properly when reverting d16ff3b. Revert "Better Android Gradle Plugin 3.x integration"
Currently breaks with the gradle version used by RN, I think there has been some work to update that to a more recent one but for now I think we should just revert it. Could not find method registerGeneratedResFolders() for arguments [file collection] on object of type com.android.build.gradle.internal.api.ApplicationVariantImpl. [ ANDROID ] [ BUGFIX ] [ react.gradle ] - REVERT "Support Android Gradle Plugin 3.x and AAPT2"
[ ANDROID ] [ FEATURE ] [ react.gradle ] - REVERT "Expose the bundling task and its outputs via ext properties"
Stateless functional components don't support refs and we need that for the component to work, it used to crash with this error message: `undefined is not an object (evaluating 'this._component.getScrollableNode')`. This makes it clear what the issue is. Fixes some of the errors in #10635, not sure if it fixes all the cases described in the issue though. Tested that passing a component with createClass or extends Component works but passing a function causes an error. Tested that download progress shows up properly when reloading the app.